by Herbert W. Eustace, C.S.B. Mr. Herbert Eustace was a prominent Christian Scientist in the early years. He served as a trustee of The Christian Science Publishing Society, pursuant Mrs. Eddy’s Deed of Trust of 1898 from 1912 through 1921. 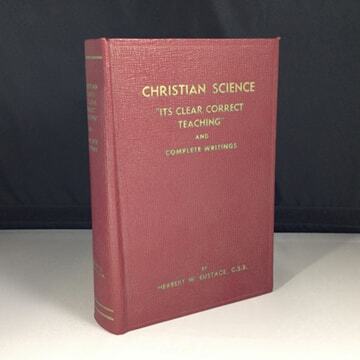 Following his excommunication from the organized church in Boston in 1922, Mr. Eustace continued to teach Christian Science as an independent into the 1950’s. This volume is a collection of all of Mr. Eustace’s published writings including many explanatory articles and books which he had authored.